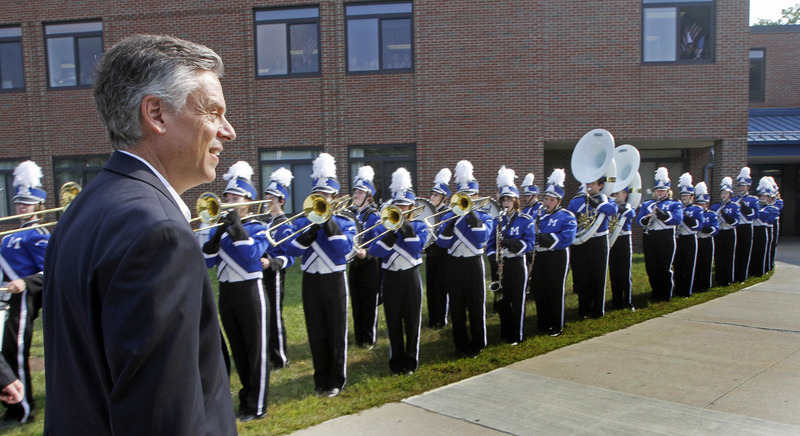 MERRIMACK, N.H. -- He may be a cellar-dweller in the polls, but presidential candidate Jon Huntsman was welcomed like a hero Wednesday at Merrimack High School in New Hampshire. A marching band lined the school's entrance, and a banner--"Welcome to MHS Mr. Ambassador, Governor Jon Huntsman" - waited just inside. The school has become known for its Chinese exchange program and multilingual course offerings, including Chinese language and Arabic. Huntsman, recently ambassador to China under President Obama, spoke in Mandarin with the exchange students and greeted each student enrolled in the Chinese language course: "Ni hao." After a tour of the school and lecture to a group of not-yet-voters on the advantages of pursuing careers in physics, Huntsman faced reporters - and questions about this week's recent debate performance, which some pundits have criticized as having been too focused on one-liners. He retorted with a critique of the debate. "I think we learned how much time fundamentally can be wasted on the drama of a couple of issues that really have not much to do with our long-term well-being in this country," Huntsman said, citing the "bottom-line economic issues, bottom line education issues, and bottom-line foreign policy issues" as among those needing to be addressed. But Huntsman seems to tacitly recognize his own inability to break through at the Monday night debate. After one voter at a Monday meeting with local business owners in Hampton, N.H. applauded Huntsman for "sticking to your guns" during the debates, the GOP hopeful called the face-offs "difficult." "Because you really can't focus on the big-picture issues, you know," Huntsman said. "They jump from drama to drama, soundbite to soundbite." And he's moved on to a new pop culture reference. Chowing down with state Sen. Nancy Stiles over a big plate of seafood at the 401 Tavern in Hampton, Huntsman observed. "You know there was a great line in Wayne's World, the movie, something like, 'Not worthy, not worthy.' Hardly worthy of this kind of food."